If you were out riding on the Highmark QUAD Bike course prior to this years race, you may have run into some windblown challenges. On July 2nd, twelve days before the race, a severe windstorm hit an area almost centered by Arneman Road, a key part of the bike course. The road itself was closed from the evening of July 2nd to July 6th when the last sections were cleared. 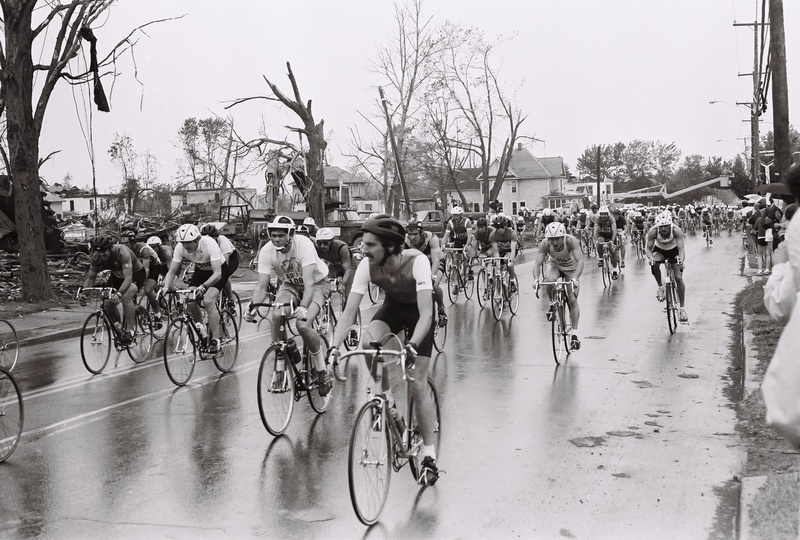 For many days after, riding the course was an eye-opening experience as giant sections of timber and debris were pulled back to the edges of the road. It wasn’t the worst storm to ever threaten the QUAD Bike Race. 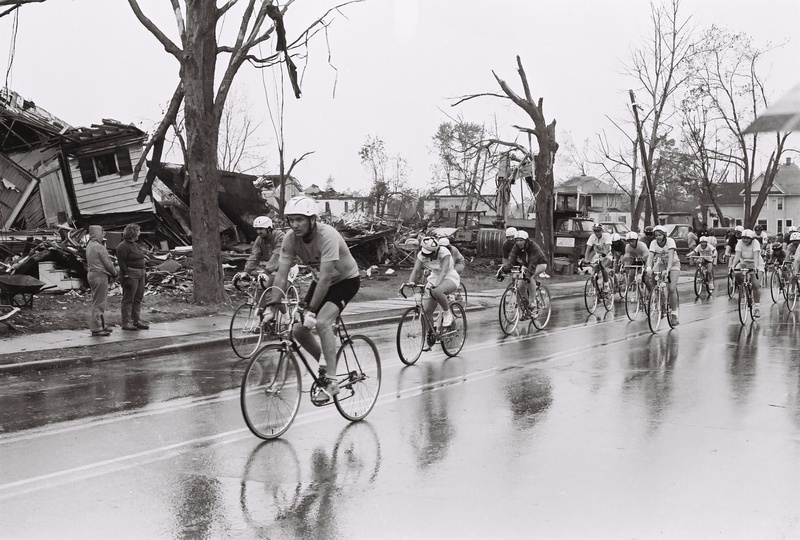 Very early in the history of the QUAD Games, on May 31, 1985 a tornado hit the borough of Albion then the site of the QUAD Bike Race. The tornado was part of a massive series of twisters that hit parts ofOhioandPennsylvania, the most violent turbulence to ever hit this region. Some 67 people were killed in the storms, eight in the Albion area. In those days the QUAD Bike race was a mass start event and fell earlier on the summer schedule than it does now. That year’s race was set for Saturday, June 15 just two weeks after the storm destroyed major parts of the town, coming onto Main Street(Rt. 6N) almost precisely where the starting line would be. This was just year #3 of the QUAD Games and along with the fact I lived in Platea at the time, just five miles north ofAlbion, the whole experience is seared into my memory. Each day at noon in the town fire hall, community meetings were held to work with the many emergency concerns that needed to be handled on a daily if not hourly basis. Into this mix, I attended the meetings to discuss of all things, this still rather new thing called the QUAD Bike Race. I don’t mind telling you, I felt extremely awkward even bringing the subject up when there were so many sad and desperate stories and so many people in need, many whose lives were changed forever. To the everlasting credit of the community leaders, they listened to my pledge that I would hold the race as planned, postpone it, move it, cancel it or do whatever they felt was in the best interests of the community. After very little discussion, the agreed that their goal was to “get things back to normal” as quickly as possible and they would consider having the race on its originally scheduled date on the very same storm ravaged streets if I could pull it off. I wasn’t sure if I could but I was honestly so inspired by their attitude and the fact they gave the race such consideration, I was determined to make it happen. What followed on June 15 was likely the most memorable QUAD event in the 30 year history of the Games. Saint VincentHealthCenter, sponsor of the Games then, announced they would donate to theAlbionrecovery all proceeds from the bike race which spiked a last minute rush of entrees. On the day of the event, nearly 800 cyclists crowded the streets for the mass start event (which was done in three waves.) A local Penn Dot employee loaned me the use of a bucket truck so I could get up over the flood of bikers to give last minute race instructions. 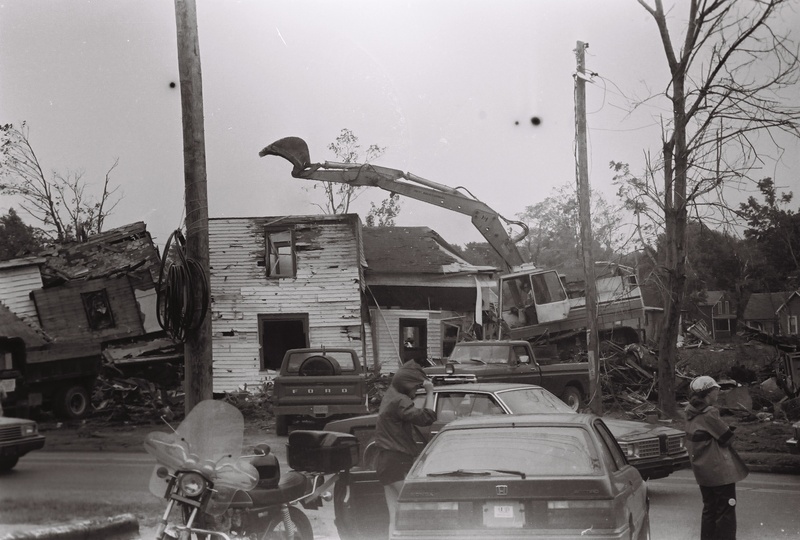 From that vantage point above the streets and crowd below I watched as an excavator pushed aside the debris of a wrecked home while the now homeless family walked behind the dozer to find pieces of their belongings. It was that very emotional scene that caused me to choke up and barely get out the word “Go!” I hollered into a bullhorn. In a long stream, the QUAD bike riders flowed away downMain Streetwhile the family below continued to sort through the wreckage of their lives.